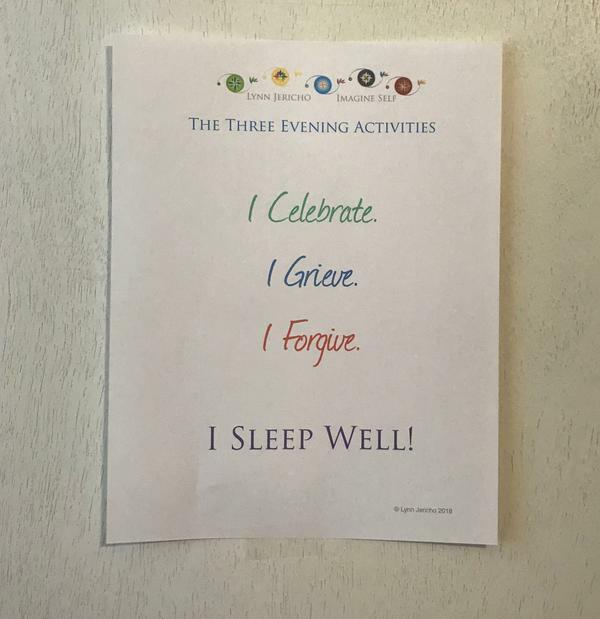 My thoughts on the three inner evening activities, celebrating, grieving and forgiving are evolving and expanding. I have written about each soul activity a number of times in the past always asking myself many questions, working from many perspectives but I never put the three of them together. Together they are a moral trinity of self fulfillment.Understanding them as a daily evening practice has awakened a new relationship to the necessity I feel to spend my last waking thoughts celebrating, grieving and forgiving all that has happened in my life. I end my day with these activities of soul and I will end my lifetime and welcome death with them. When I get into bed at night I struggle to apply my sleepy consciousness to question what in my day do I celebrate, do I grieve, do I forgive. (Being sleepy is one of my most frequent justifications for moral laziness.) I find focus and energy for this nighttime activity by imagining my angel listening to my soul wanting to know how my earthly existence unfolded during the day…how did I morally breathe myself into my life today and what in others and the world did I breathe into my soul? Moral breathing reflects the reality that the first act at birth is to inhale and the last act at death is to exhale. If we consider waking as being born into the day and falling into sleep as the dying of the day we can imagine moral breathing. I look for the breath of truth in my thinking, beauty in my feeling and goodness in my willing and how I witnessed all three in others. I look for the breath of freedom in new meaning in the present, new compassion for the past and new imagination for the future. I look for the breath that poured forth love and warmth for the familiar and the different. What breaths I find, I celebrate. What breathing I feel was lacking or lost, I grieve. When I perceive the suffication of selfishness, laziness, meanness, violence, rigidity or error, I forgive. Actually, I need to say, I strive to live into these activities, most nights my attempts are feeble. My angel gives me a tender smile, not a high five. Thinking and writing these posts have really grounded my understanding and empowered my enthusiasm for this evening practice of celebrating, grieving and forgiving. Please read my words and then question my thoughts and start writing your own thoughts on celebrating, grieving and forgiving. Please share with me your inspirations! Email me. This post focuses on forgiveness, possibly the most complex of the trinity. What is happening when we look at our day with the eyes of forgiveness? How do we forgive self, others, circumstances and fates. Do we color our day with regret, guilt and resentment. Do we consider hurt, harm and hindrance? Do we think of being right, of revenge and punishment? Do we wish we had done things differently defining our thoughts, feelings and deeds as unwise, selfish, blind, careless, cowardly, mistaken etc? These judgments come about as a story that has an element of tragedy and so much shadow. Forgive. Guilt means we consciously chose a thought, a feeling, a deed that caused harm, hurt or hindrance to yourself or another or the earth. Regret comes when we were unconscious, naive or unaware of the result of our thought, our feeling or our deed and become aware that if only we had been awake we would have done it differently. Forgive. Punishment is an attempt to get even, to correct through suffering. What happens to your soul when you as victim become the punisher? When you as perpetrator become the punished? Does anything change? But if you forgive…the forgiver or the forgiven…your soul brightens. Please don’t confuse forgiving with forgetting. Forgetting brings no blessing. Forgive. Forgiveness is inhibited by our judgments. We must not judge. We discern. Forgiveness arises when we discern with compassion free of the victim/perpetrator judgments. I fall into judgment all the time, but it gets me nowhere. Forgiveness gets me to moments of wisdom, love and a purity of soul. Forgiveness allows us to recognize the gift, the meaning and purpose in the hurt, harm or hindrance whether we were victim, perpetrator or witness. We come to see what it was given for. We become accountable, objective, compassionate. Forgiveness allows us to begin again, to renew, to resurrect, to raise up, to refresh, to restore. Forgiveness means life with all its imperfections is developmental, not degenerative. Forgiveness is not about wishing life was different. This work with grieving and forgiving is seeing life as a path with undeniable purpose living in the messy, the undone, the lost and the painful. If we practice celebrating, grieving and forgiving we come to integrate the complexities of life as it is and as it is meant-to-be. What do you struggle to forgive? How different would your waking life be if you went to sleep forgiving? My favorite and highly recommended way of practicing the art of celebrating, grieving and forgiving is to keep a celebrating/grieving/ forgiving journal. Nothing enriches our sense of self more than creative recording and imaging in words and pictures. Working with pictures. You may want to journal daily or weekly and then monthly or seasonally reread your entries and spend sometime looking for images on the web or even drawing your own that offer a visual image of your thoughts and words. Write about your celebrating, grieving and forgiving. Take time with your thoughts and find the right words and phrases. Do this with humor and gravity…a powerful combination.